Update: This giveaway is now closed. The winner is Jenny B. Jenny was selected by random.org and her comment was: “I have never heard of Kelly’s book or blog before, but she is on a similar healing journey to our family’s and I am looking forward to learning more. I would be honored to have a copy of her book. Thanks for making this available!” Congrats to Jenny B. and thanks to all who entered! Special thanks to Kelly for graciously offering her book! Be sure to check out other reviews and giveaways on my Out and About page. Kelly Brozyna (The Spunky Coconut) first shared her Vanilla Bean Cake back in June 2009. I loved how creative her recipe was and how delicious it looked from the moment she shared it. And, it didn’t take long for Spunky Coconut reader reviews of this recipe to start pouring in. Now if you don’t know Kelly, her blog, and this recipe, you may be wondering how a cake with a vanilla bean is unique. But you see … it’s not a cake with a vanilla bean. It’s a grain-free cake made from cooked white beans and some coconut flour. The vanilla factor comes from the liquid vanilla crème stevia. Vanilla + bean = Vanilla Bean Cake! I have long drooled over this cake, but never had all the ingredients until late last week. First, my copy of Kelly’s new cookbook, The Spunky Coconut Grain-Free Baked Goods and Desserts, arrived—courtesy of Kelly. The following day, my Tropical Traditions coconut flour was delivered. The recipe for Vanilla Bean Cake is in this latest cookbook (and on Kelly’s blog here). Finally, I was ready to make Kelly’s Vanilla Bean Cake. It was easy to make and it did not disappoint! It’s a lovely yellow cake full of all the good stuff—especially protein and fiber. Nobody would ever guess the main ingredient. This cake was so good “as is,” that I didn’t even frost it right away. As you can see in the photo by the time I did frost it, it was almost half gone. I used Kelly’s frosting recipe using Scharffen Berger bittersweet chocolate as my choice of chocolate. Instead of waiting for the frosting to firm up in the refrigerator enough to be spreadable, I poured it over the cake after just a few minutes. I poked a few holes in the top of the cake so that my thin version of the frosting would permeate the cake in spots. Of course, the frosted version provided a completely different, but still delicious experience than eating the cake by itself, but I loved them both. If you know Kelly and her blog, you already know that she’s been healing her family of celiac, gluten intolerance, ADD, and autism through food and biomedical treatments the last several years. 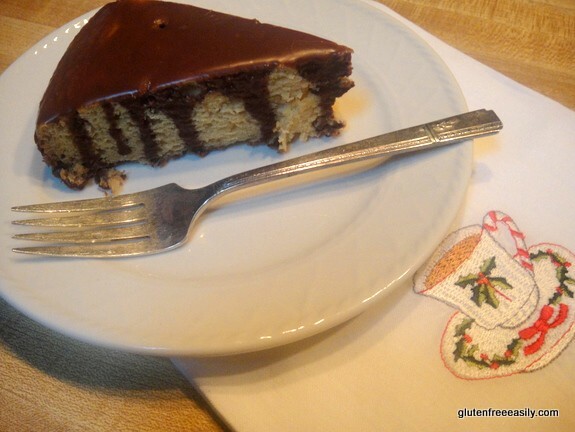 Kelly’s recipes are gluten free, casein free, refined sugar free, and often egg free, but like the Vanilla Bean Cake, they are all amazingly delicious. So many who are living with intolerances have benefited from Kelly’s blog and recipes. Now add to that two cookbooks! Kelly’s cookbooks are totally her own creation, including the photographs. That’s rare in cookbook publishing from what I’ve seen, but Kelly and her husband, Andrew, self publish through their Apidae Press. The cookbooks are printed on demand within the U.S. I loved Kelly’s first cookbook, The Spunky Coconut Cookbook, and still do, but I have to say that I love this one even more. There are 80 recipes, including 50 that are egg free. And, this cookbook is just gorgeous! I read through it and loved it all—the Foreword by Ali (The Whole Life Nutrition Kitchen), Kelly’s introduction and recommendations, and, of course, all the recipes (with ingredients I use) and those stunning photos. Then I put her cookbook down. A few minutes later, I picked it up again and looked through it. Then I set it aside. Then I picked it up and flipped through the pages once more. The cycle kept repeating itself. It’s such a beautifully done cookbook that it’s truly irresistible. I’m lucky to call Kelly a friend and especially honored and grateful that she mentions me and gfe twice in her new cookbook, but I’d highly recommend this cookbook even if I didn’t know her. 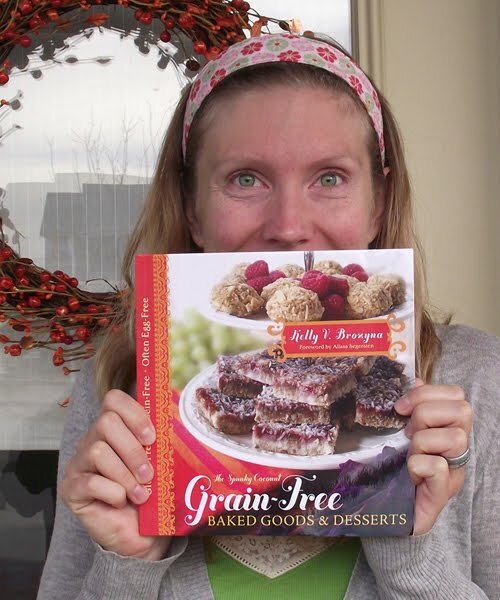 So here’s the really great news … Kelly has graciously donated a signed copy of The Spunky Coconut Grain-Free Baked Goods and Desserts to one lucky gfe reader! There are numerous ways you can enter the giveaway. One entry is all that’s required, but feel free to do them all. (If you don’t enter giveaways, you can purchase Kelly’s new cookbook through her Spunky Coconut store here or via Amazon here.) This giveaway will end Sunday, December 19, at midnight Eastern. ~Leave a comment telling about a recipe you’d like to make from The Spunky Coconut. ~Post about this giveaway on your blog and/or share it on Facebook. Leave a separate comment here saying that you did. ~Tweet about this roundup/giveaway using @Shirleygfe and @spunkycoconut. Leave a separate comment here saying that you did. ~Subscribe to gfe via reader or email. Leave a separate comment here saying that you did. ~“Like” gfe on Facebook. Leave a comment here saying that you did. ~“Like” The Spunky Coconut on Facebook. Leave a comment here saying that you did. ~Follow me on Twitter. Leave a separate comment here saying that you did. liked the spunky coconut on FB. Next I really want to try her pumpkin spice cake. It looks delicious! I’d love to try just about every one of her recipes! Do I have to pick just one? The vanilla bean cake looks great! My family really enjoys her banana bread! i’ve liked gfe and the spunky coconut on facebook, and entered my email – i’d love to win kelly’s new books!! thanks for posting – your insight and experience is helping many!! I just “liked” gfe–gluten free easily on Facebook! I would love to make any of her bread recipes. I am need of bread recipes and since she lives in the same state I do I’m sure my bread issues (not rising) will not be a problem. I made her thumb print cookies for Christmas and those are good. I also “like” Spunky Coconut on fb. i am following you on twittter! i hope i win that great new cookbook as i am grain free. Already like Spunky Coconut on Facebook :0) Would LOVE this new cookbook! I can’t pick just one recipe of her’s I’d like to try, but I’m starting with the vanilla bean cake! I already follow you (and Kelly) on Twitter! And I already subscribe to your blog (it is one of my favorites) on Google Reader. I have never heard of Kelly’s book or blog before, but she is on a similar healing journey to our family’s and I am looking forward to learning more. I would be honored to have a copy of her book. Thanks for making this available! “Liked” the facebook page. Looking forward to updates! I “liked” both gfe and Spunky Coconut on Facebook. I cannot wait to make the Vanilla Bean cake – it looks so perfect and the ingredients are everything I am “allowed” to eat. I do have a question regarding the Stevia. I still haven’t broken down and bought any – what happens if you just leave it out? It seems like such a small smount; does it really have a big impact? Can there be a substitution? Or should I just go ahead and buy some? Just subscribed to GFE. Looking forward to learning more!! Your French bread rolls look great. And I can’t wait to make Kelly’s white bean cake. My daughter’s coming home from college this weekend and I want some good baked goods to feed her! She’ll be impressed. I Like your site and Kelly’s on FB as well! Thanks for all your good work. Hi Nancy–FYI–Those French bread rolls come from Linda at The Gluten Free Homemaker. 🙂 Hope you have had a great weekend with your daughter! Last, it looks like you are new here … welcome to gfe, and many thanks for the kind words! I like The Spunky Coconut on facbook! I like The Spunky Coconut on FB! I would def. love to try Kelly’s vanilla bean cake. For that matter, I haven’t seen a recipe I haven’t wanted to try! My daughter and I love Kellys blog and cookbook and would love her new book! My 3 year old walks around the house telling me she wants to make a recipe from the “coconut lady”! I have made the marble bean cake and it’s delicious. I’d like to try and make her cinnamon raisin bagel recipe and her orange cake recipe! Where to start? I would love to make the vanilla bean cake! I subscribe to gfe via email. I “like” The Spunky Coconut on Facebook as well! I follow gfe on twitter. I liked the Spunky Coconut on Facebook. I just love the Scandinavian Thumbprint Cookies and made them the third time yesterday, yummie! I “like” The Spunky Coconut on Facebook! I am now an email subscriber to gfe! I love your site, have been following it for a long time and I am waiting for my Chrismas gift (a Vitamix?) to make a Clementine Cake! Hi Arleen–What a sweet comment—thank you! Hope you get that Vita-mix (I’ll be jealous!! ), but if you don’t or don’t want to wait a week, the Clementine Cake can be made using your blender. It’s divine! I would love to make the Swedish Meatballs. I have missed eating them! It’s tough to choose just one recipe I’d like to make, but I think I’d have to go with the vanilla bean cake if forced to make a decision!! Any raw, sugar free and/or gluten free version of a standard recipe always interests me…especially in desserts! The vanilla bean cake looks simply amazing. I’ve been working my way through the spunky coconut’s site. Next on the list is her pie crust. I tweeted about the giveaway and mentioned you. I’d like to make her light airy chocolate chip muffins. I’ve just started to bake gluten-free and those look easy and tasty. Thanks for introducing her to me. I subscribed to her blog. I would love to make any of her cookies recipes. I’d like to make her vanilla bean cake. In your picture, it looks absolutely delicious. I have celiac disease and have to follow the specific carbohydrate diet, so Kelly’s cookbook, being grain-free and naturally sweetened, is really of interest to me. It’s great to see her creating breads and desserts that are healthy and grain free. Thanks for introducing her to me. I would be so excited to eat delicious, lower-carb goodies like the Vanilla Bean cake! The star shaped Christmas Cookies (gluten free) look really good. I can’t believe that stuff has no grains. The pictures look delicious. I posted a link to this contest on my Facebook page. I want to try the Vanilla Bean Cake!! Yum! I love Kelly’s recipes and have made lots of them but have never made the vanilla bean cake! I “like” gfe and Spunky Coconut on Facebook! Also, I would LOVE to win this book, not only for myself, but for all of the families I have in my support group. I run a lending library for the group, and a majority of the families have kids with specials dietary needs and restrictions. I personally have 2 boys with autism and we follow a diet free of gluten, casein, soy, egg, nuts, citrus, etc. I’d love to share this great resource with other families! I can’t wait to make this cake.. I have made black bean brownies and love them! Now have to make them GF… My goal is to be GF soon! I’ve heard so much for the better of changing. Thanks for letting me learn from you. Thanks for the link to follow by email too. I would like to make the Raspbery chocolate cake. it looks soooooooooo good. I “liked” gfe–gluten free on Facebook! and would have done it anyway, but would love the cookbook 2! Strawberry chocolate muffins would be awesome! I would love to have this cookbook! I would like to make the Coffee ice cream. It is so hard to find coffee ice cream these days so why not make it from scratch. Thanks Shirley and Kelly for this great book giveaway. I just posted about your giveaway on my blog! I would love to make Kelly’s Scandinavian Thumbprint Cookies she just recently posted on the spunky coconut blog. what timing! I had soaked and cooked beans to make the vanilla cake. I can’t wait to try this. 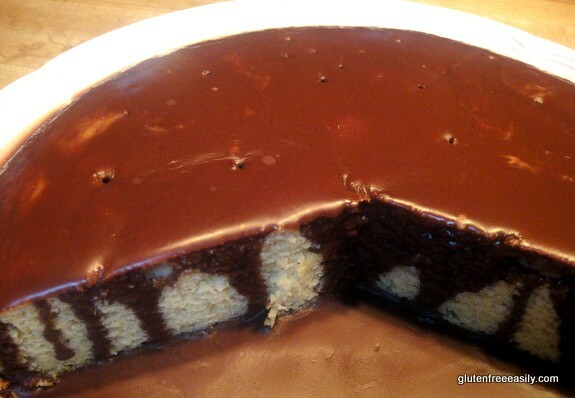 I also want to make a chocolAte version or the marble cake. I liked gfe on facebook. I like The Spunky Coconut on Facebook. Liking you in facebook because I saw Ali’s post on fb, and anything Ali likes, I like, but especially the thought of a free gf cookbook with eggless recipes! Definitely, Cinnamon Raisin Flatbread. My daughter misses her cinnamon swirl bread for breakfast, this just might just be the answer!!! I already subscribe to GFE by email! I already like gfe on FB! I already like The Spunky Coconut on FB! I already subscribe to gfe via google reader. Thanks for sharing this wonderful idea for a cake! The play on words in the name threw me off for a while, thinking that it meant “vanilla beans.” I’ve had flourless chocolate cakes, and lentil brownies, and bean-flour piecrust, but this is the first cooked white bean cake I’ve seen, so I am eager to try it. Cake looks great. I have The Spunky Coconut Cookbook and enjoy it. hi, I have visited Kelly’s site several times. too many to count actually. She and her site are amazing!!! I did make the vanilla bean cake and was quite impressed.It was so good. and if you did not know better you’d never believe that it has beans in it. I will definitely be trying some more of her recipes. I’ve made Kelly’s vanilla bean cake several times…including tonight. It’s a great pregnancy craving to have since it’s so full of nutrition from the white beans, coconut flour and coconut oil, and eggs. Chocolate has antioxidants too, right?! 🙂 Thanks for the giveaway! I subscribe to gfe via google reader. I’d like to make her lasagna! YUM! Thanks for the giveaway! subscribed to gfe by email! I would make the Vanilla Bean Cake first. It looks great. I liked The Spunky Coconut. I love coconut. I would like to make any of the grain free treats in Kelly’s new cookbook! I’m sure they are all delicious, just like her first book. i’m subscribed to gfe via email. i “like” the spunky coconut on fb. I love her vanilla bean cake. And her Kerstin’s Almond Squares look yummy! I am just finding all good things about coconut oil ….My husband had a heartattack and now diabetes and he loves sweets so i could use a healthy cookbook. I just found out about you on facebook….I look forward to your info. My kids adore her vanilla bean cake! I can’t wait to try some of her new egg free recipes too! I have been wanting to make the infamous vanilla bean cake. Went to whole foods today. I finally have everything. Oh, how I wish I could reply to all of you! Please know that I am in my head, but my fingers are too weary to actually do so and the Christmas “to do” list isn’t being whittled down fast enough. 😉 Thanks so much for all the social connections to gfe and to the Spunky Coconut, and, of course, thanks for all your wonderful comments and entries! Wow! Just saw that I won! How exciting! We just found out that my mom, who will be 68 on Sunday, has developed diabetes. In addition to be a great resource for my own family, I am looking forward to sharing some of the tasty treats from this cookbook, as sweets are one of her biggest temptaions. Now I can offer her some healthy versions and try to get her blood sugar to stabalize. Thanks so much, Shirley and Kelly!! You’re very welcome, dear … happy holidays to you!